Be the first to share your favorite memory, photo or story of Leona. This memorial page is dedicated for family, friends and future generations to celebrate the life of their loved one. 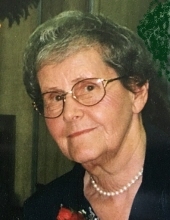 Leona E. Musselman, 87, New Holland, PA formerly of Gettysburg, PA went home to be with her Lord Monday, April 1, 2019 at Garden Spot Village in New Holland. She was born May 19, 1931 in Hagerstown, MD, the daughter of the late Luther and Katie Eshelman Grove. She is preceded in death by her husband, Melvin, and granddaughters, Ericka Horst, and Colleen Musselman as well as 6 siblings. Leona was a former member of Bethel Mennonite Church and most recently a member of Community Church of Garden Spot Village. Family was a large focus of her life, being very generous and thoughtful in many ways. Her strong faith in God was evident in how she faced life’s challenges and in the ways she served others. She was a valiant prayer warrior for her family, lifting each by name in prayer every day. She was an avid quilter in her later years as well as crafted many comforters for Mennonite Central Committee. She had a passion for baking with cinnamon rolls and pies being her specialties. Mrs. Musselman is survived by four children; Linda Fair and her husband Neil of Lancaster, PA. Ronald Musselman and his wife Pat of Lewisburg, PA, LuAnn Horst and her husband Ron of Lancaster, PA, Randall Musselman and his wife Deborah of Dover, DE. She had 8 grandchildren; Valeri Hartman, Brad Fair, Kyle, Ryan and Emily Horst, Andy and Kelsey Musselman, and Sage Musselman, and 6 great-grandchildren. Burial will be private and at the convenience of the family. A memorial service will be held on Sunday, April 14 at 3:00 pm in the Garden Spot Village Chapel in New Holland, PA. In lieu of flowers memorials can be made to Community Church of Garden Spot Village. Online obituary and condolences available at monahanfuneralhome.com. "Email Address" would like to share the life celebration of Leona E. Musselman. Click on the "link" to go to share a favorite memory or leave a condolence message for the family.